This blog will be a helpful guide of how to do bicep exercises with resistance bands. 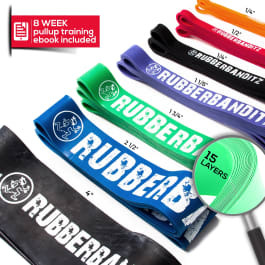 Resistance band bicep exercises are unlike any other workout for your bicep muscles. While resistance bands are great for all of your muscle groups, using bands can provide a deeper, more intense workout to increase the size and strength of your biceps. The biceps are also known as the biceps brachii, which is a two headed muscle attached to the upper arm. It is an important muscle in the upper body that has to be exercised using resistance training to increase the size and strength. There are many exercises that improve and strengthen your biceps and forearms. Instead of doing dumbbell curls all day, try incorporating resistance band bicep exercises to build muscle. If you’re unfamiliar with resistance band bicep exercises, this type of training uses an opposing force of resistance to train your various muscle groups. Resistance training equipment has traditionally included free weights such as dumbbells and barbells or exercise machines which can be hard on your joints and limited in their effectiveness. Bicep exercises with resistance bands provide the ideal workout to help increase stamina, performance, energy and muscle size. When you perform resistance band bicep exercises, you’ll have a wider range of motion compared to using a weight machine that limits the range of your movement. Resistance bands create resistance from different angles, maximizing the stress placed on your muscles resulting in muscle growth. Bicep exercises with bands allow you to vary your movements and customize your workout with different amounts of resistance. For instance, if you want high repetitions, then a band with a lower resistance would be used. If you wanted a more intense workout with fewer number of reps, then a band with the highest resistance level would be used. 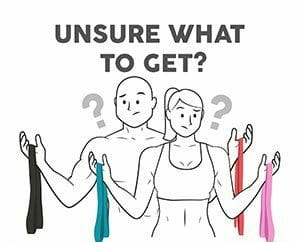 Other options to vary your workouts can be done by using two bands simultaneously instead of one or by clutching the resistance band with your hands closer together. This exercise is the first one that most people use to build their biceps. The movement is very similar to a regular biceps curl with dumbbells. 1. Grab the end of the bands (one in each hand) and step on the middle of bands. 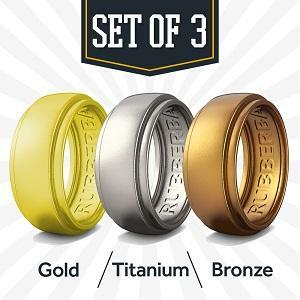 The band should be in the center of your shoes. 2. Keep your head and chest upright, feet shoulder width apart, back straight and your stomach tight. 3. Begin with your arms extended down and tight to your sides with palms facing up. 4. Curl the bands all the way up while keeping tension on the biceps. 5. Slowly lower your hands back to the starting position and repeat the movement. 6. Perform 3 - 4 sets with 8 to 12 repetitions. This exercise is an excellent alternative to bicep curls with resistance bands. By turning your hands over and palms facing down, you elongate the bicep muscles and put more pressure on the forearm muscles. 1. Start with your legs shoulder width apart, stand on the resistance bands and take an end in each hand. 2. Keep your head and chest upright, back straight and your stomach tight. 3. Begin with your arms down and tight to your sides with palms facing backwards. 4. Pull the resistance bands up and bring your arms up until your hands are level with your chest. 5. Do not allow your elbows to move during the movement; they should be stationary at your side. 6. Perform 3 - 4 sets with 8 to 12 reps. This variation of the traditional hammer curl is an exercise that isolates and targets your arm muscles. It is an effective exercise for enhancing the size and strength of your arms which can be done almost anywhere. While performing the exercise, the motion mimics the pounding of a hammer and fully stretches and compresses your biceps. 1. Sit on a chair or use an exercise ball to engage your core. Place the resistance band under your feet. 2. Keep your arms and back straight and feet flat on the floor. 3. Start with both of your arms at your side. 4. Grab the resistance band and curl it up toward your shoulders. Be sure to keep your elbows still during the movement. 5. Slowly return to your beginning position to complete the rep. Using resistance bands to perform one arm preacher curls is one of the best ways to increase size and build strength in your biceps. Because the active arm is restricted, the isolation allows deep work of the muscle. This exercise can be done anywhere since it doesn’t require an anchor point for the bands. 1. Wrap the resistance band once around your foot on the same side as the arm you intend to use. 2. Grip both ends of the band with your hand. 3. The arm you intend to work should be almost completely straight with a slight bend and your palm facing forward. 4. Position your body so that your head is straight, your back is flat and the chest up. Your other arm should be across your body to help stabilize your active elbow. 5. Pull the band and bend your arm until your hand is at chest level. Be sure not to twist, but lift straight up. 6. Make sure to get the full benefit of the motion and go slowly back to the starting position. 7. Perform 3 - 4 sets with 8 to 12 reps. Perform these bicep exercises with resistance bands three times a week and you will see a noticeable increase in the size, strength and performance of your biceps. Since bicep engagement comes from a pulling force, which also often times engages your back muscles, we recommend integrating them in your workouts so that you combine them with a range of other muscle groups. Resistance band exercises for biceps normally force you to engage your core to maintain stability, so make sure to concentrate on keeping your ab muscles clenched and divert the burn to targeted areas. Like what you are reading? Try it out and let us know what you think. 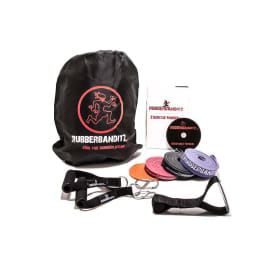 Email or tag us on social media @rubberbanditz so we can see you progress. Sun’s out, guns out, must be having fun now!